I love making collages! With this one I used a forest background and began adding animals. Guess which one was naturally a part of this photo? The elephant!! Yes, in the forest! 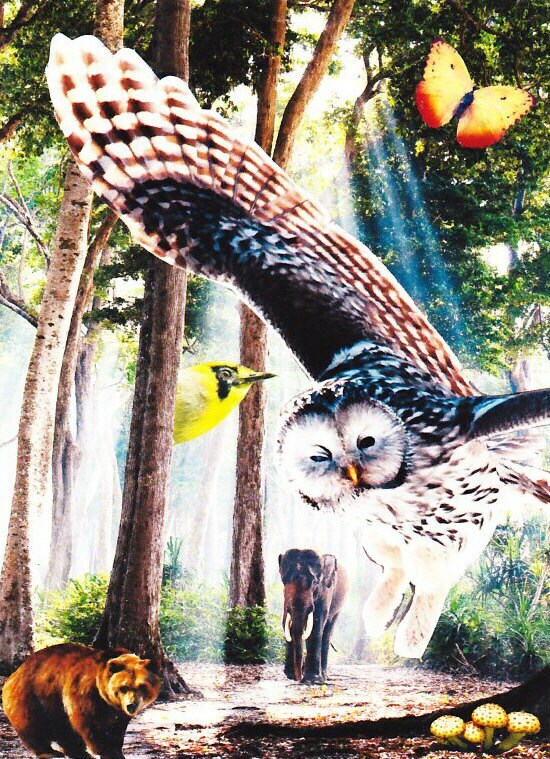 Then I saw this amazing owl in National Geographic Mag and I had to add him. The rest just began to unfold. The scan is a bit washed out. The card is much sharper "in person!" Oh my!! This is one ahhhhmazzzing card!! It is bright and real and just oh so amazing!! I will be ordering more because I have friends who would just go gaga over this one!! Gorgeous! !